I’ve been in Maryland since returning from my last teaching trip several weeks ago. Home is always difficult for me. I wrestle with issues here in my little home town that I seldom face elsewhere. Like feeling included. I haven’t sorted it all out yet, so I’m not sure what’s actually real, but the singers in my head locked arms this week and shouted like a Wagnarian chorus that I … just … don’t … belong. It felt like there were walls to scale everywhere I turned. We humans weren’t created for that. We were made for community and designed for inclusion. In fact, if I had to distill the Kingdom into one simple concept, I just might choose the word “relationship.” Isn’t that what we see in Jesus? The God-man invaded his world with arms wide open to publicans, pharisees, centurions, lepers, adulterers, drunks, and fishermen. It’s a sad thing that we sons of Adam haven’t quite gotten the hang of it yet. 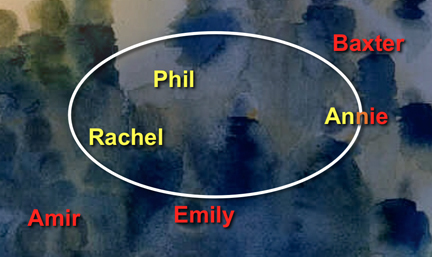 Phil and Rachel are “in.” Amer, Emily and Baxter are “out,” and we find Annie troublesome since she “converted” last year, but hasn’t done anything with it. So … is she in or out, because we really need to know. He includes everyone and invites those who will to follow him. Notice Rachel, Baxter, and Annie are going their own way, and Phil isn’t moving at all. And yet they’re loved and invited to the party nevertheless. 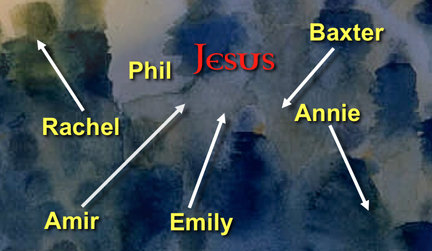 Jesus breaks down every wall and calls us into His presence and our neighbor’s presence as well. Maybe we ought to organize our own chorus and sing an anthem of inclusion. I’ll bet the angels would gladly join in. Previous PostThe Real TestNext PostDo outsiders understand Him better than His own church? If it’s any consolation, I think we’ll always “belong” in our home town because of the bonds we formed many years ago with friends and family. Thanks, Cindy. I think you’re mostly right But sometimes the feelings don’t match reality. Great point Don… The opposite is often true when dealing with the concepts of religion rather than the relational nature of Christianity. I found myself on the outside of ministry, due mainly in part to the people I surrounded myself with (or more likely who the Spirit put in my path). In worship services we designed we were a magnet for the lost, and the least. We had the Goth, and the tattoo artists, the unwed teen mothers and the recovering (and trying to recover) drug addicts. We were all somehow saints and criminals at the same time (simul iustus et peccator). All of these people desperately needed Jesus the same way I desperately needed Jesus so we simply gathered, worshiped and mingled our life stories with the life-giving story of Christ. The bottom line is that the established church never saw the beauty in these people or in the transformational nature of God, and so we all found ourselves on the outside of religion very fast. I visited with some of those young people last night, and many of them and their friends are still on the outside, mainly due to the way they were treated. Thanks for sharing your thoughts here.. and thanks for sharing with me as a young person, the importance of community and that Jesus sets a big table! “Jesus sets a big table.” I like that. Thanks, Bob. Your encouragement goes deeper than you know. Don-Again your blog gets me thinking and wondering.I find it hard to identify and communicate w/folks here because of the rich life I have been given. One of the things I wish I had time for is just listening and hearing the stories others have to tell. I am about to be replaced as president of our loosely organized association so may ne yet I’ll get my chance.My youngest son is a pastor in Indiana and when we talk on the phone and he prays for out family that really helps. One of the reasons you feel isolated is because people probably have you on a pedestal. That used to drive me up the wall, but here I don’t have that problem, although they do seem to think I’m weird.BUT aren’t we all ? Blake and his boys seem to be doing well. I had sent Balke’s wife a devotional booklet that was brief and helpful to me when Paul was ill and then died , so I’m hoping Blake will get curious and read it and that Holy Spirit can stir his heart. Wonder if I’m still yting to be a mama trying to fix her child. I feel that way a lot of the time. I am a Christian, but even at church I feel like I do not belong. Several reasons could be because I have only been here 7 years instead of 20 years, I am a single woman and there are not a lot of single women in our church. I am quiet, introverted and used to be extremely shy so I have never learn to make friends. Some of it could be the enemy, who works on our weaknesses to discourage us. Except for God, people seem to have their cliques. They are comfortable around people they see all the time, who they have a lot in common with. Don, you stand out because of your experiences over the past 30 years. And you have been away a lot of the time. Many people may think of you as a kind of Christian celebrity. I think small towns are probably the worst for excluding people who are different in some way. I think Florence is small enough to be that way. I am thankful that GOD is willing to include every human being.